June 19: Breakfast with the Birds - Amazing Life of Beach Nesting Birds. Register at Rookery Bay. June 10 - 16: The next count window for the Breeding Bird Protocol. If you’re surveying a route with active nesting, weekly surveys help capture information about peak counts. April 25 - June 20: To help with the 2018 rooftop study, please try to survey rooftop sites every week. To learn more about the study please read the article below. All Summer: Beach stewards are needed at important beach nesting sites. Check out the map of local stewardship opportunities and contact us to get involved! The Gulf Coast received more than beachgoers on Memorial Day weekend. Subtropical Storm Alberto lumbered along Florida's west coast, making landfall in the panhandle on Monday. Before the storm, Florida Shorebird Alliance partners reduced possible threats to wildlife by temporarily taking down posting twine. After the storm, partners rallied to repair posting and assess the impacts to beach-nesting birds. 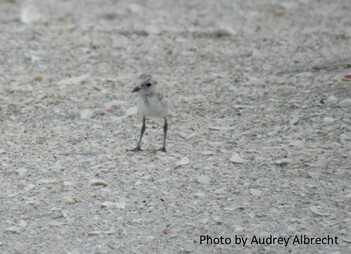 Across the gulf, impacts to shorebird nesting areas were as varied as the birds themselves. In southwest Florida, Marco Island received complete overwash and colony losses, while important nesting areas in the panhandle experienced less impact than expected. As much as we are saddened by the losses around the gulf, we are also inspired by the resilience of the birds. FSA partners have reported that in most areas of impact, shorebirds and seabirds have already begun re-nesting! These hearty birds have evolved alongside storms and rely on early succession habitat that form because of the storms. And because this storm occurred so early, beach-nesting birds have another chance at success this season. Although we cannot control what mother nature brings to our shores, storms such as Alberto underscore the importance of all the other ways we can support successful nesting. One of the most important activities we can do is stewarding nesting sites throughout the summer. If you would like to proactively participate in helping shorebirds thrive, read on to learn more about how to get involved in beach stewardship. Do you like talking about birds to beach goers, and helping our remarkable shorebirds and seabirds thrive in the process? If so, sign up to become a Bird Steward! 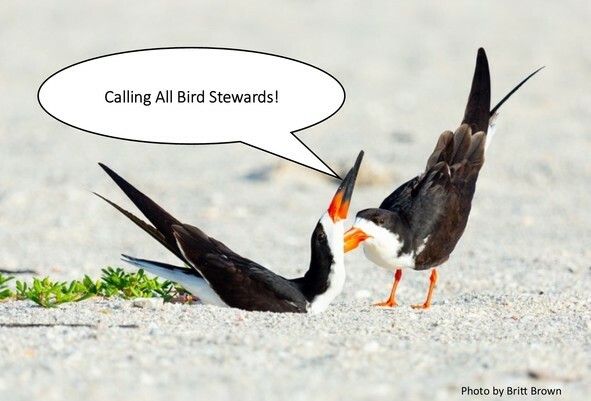 Bird Stewards are needed at shorebird nesting areas during the breeding season, especially during high beach traffic weekends, and holidays. Learn more about becoming a beach steward. To sign up, contact your local Audubon Stewardship Coordinator below and they will get you trained to be a Beach Steward. Your stewardship is greatly needed and appreciated! Summer is in the air, and for shorebirds and sea turtles, eggs are on, or in, the beach. And that means Shorebird Alliance Partners and Marine Turtle Permit Holders (MTPH) are also on the beach. 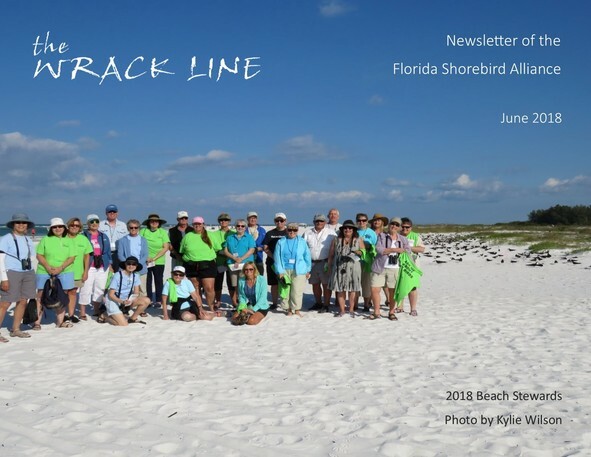 If you’re one of the persons working for the conservation of Florida’s sea turtles and shorebirds, there are a few things to remember during your time on the sand. Sea turtles access the beach at night to bury their eggs within the sand, usually ten inches or more deep. 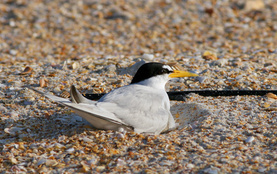 The eggs of shorebirds, however, are laid on the open sand. Also, unlike sea turtle hatchlings, flightless chicks remain on the beach until they are fledged – and they don’t just remain in the posted areas! Chicks of both colonial and solitary nesters can be anywhere on the beach from the waterline up to the dunes, and they can travel far from the original marked nest site. The primary defensive response for flightless chicks is to freeze and press against the sand surface, which makes them very vulnerable to foot and vehicle traffic. 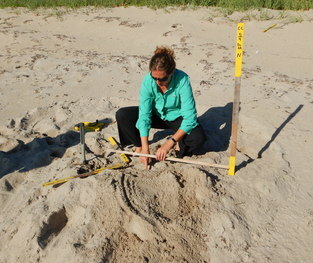 During the shorebird nesting season, Florida Shorebird Alliance partners post nesting areas by encircling the area with posts and flagging or twine. The time frame from nest initiation to fledging of seabird and shorebird chicks is typically no longer than 60 days, and determines how long an area is posted. However, because nests are asynchronous (not all nests are initiated on the same day), if there is more than one nest within a posted area such as in a large seabird colony, this time frame may stretch out over a longer period. Because each posted area is unique, it is best for MTPH and shorebird monitors to coordinate closely to determine the anticipated completion date for nesting at any particular site. When surveying on the beach please remember to respect posted areas, as often there will be eggs and chicks on the ground. Any disturbance within the site could cause the adult birds to flush, leaving eggs and chicks vulnerable to predation, exposure to the intense heat from the sun, or starvation. Chicks may become separated from their parents during a disturbance event, or adults may permanently abandon a nest due to human disturbance. Sea and shorebirds are protected under state and federal laws, and there can be legal ramifications for anyone entering a posted area, even with the best intentions. MTPH that survey a beach with posted shorebird nests must be extra vigilant, both on an ATV and on foot, during early morning surveys to watch for shorebird chicks and fledglings. Sea turtle nest surveyors must respect the posted area, entering only if specifically authorized to do so by FWC staff at MTP@myfwc.com. It is still important to get accurate information on any sea turtle crawls that might occur within posted shorebird areas or adjacent to posted nests. Marine Turtle Permit Holders should observe the crawl to the degree possible from the outside of the posted area and install a marker outside the postings or away from the solitary nest to indicate the approximate location of the crawl or nest. Once the postings for the birds are removed, the MTPH can enter the area and post as large a section as needed for protection of any potential sea turtle nests. Sea turtle nest inventories should be done after the postings are removed. If you are a Marine Turtle Permit Holder or a shorebird monitor and have questions about posted areas, please contact shorebird@myfwc.com and we will help you. Thank you for your work protecting Florida’s sea turtles and shorebirds! June is a busy month for shorebird and seabird nesting. 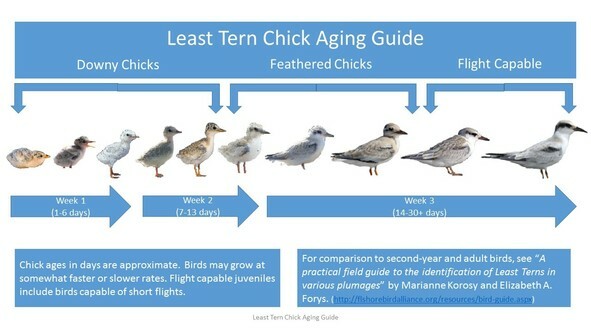 If you're a new shorebird monitor or a veteran, check out the chick aging guides that help categorize chick ages according to the Breeding Bird Protocol. Now is always a good time to refresh your skills! 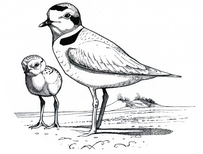 Reminder: Putting Wilson's Plover Back on the Map! The population status for Wilson’s Plover is currently unknown in Florida. However, available data indicates that the population is likely experiencing declines. For this reason, FWC is focusing on refining population estimates for Wilson’s Plover in Florida to guide conservation, management, and protection strategies for this species. Recently Florida Wildlife Research Institute shorebird biologists explored potential habitat (e.g., salt pans, gravel dike tops, etc.) at St. Marks National Wildlife Refuge and documented at least 45 breeding adults. During the most recent survey, 26 males and 19 females were documented. Observations included, 8 active nests, 13 active broods (with 20 flightless chicks collectively), and several territorial pair attempting to renest after losing their nests to predators. Additional highlights of coverage at the refuge include discovering breeding adults that were banded as chicks at sites elsewhere in the panhandle. These individuals had disappeared after fledging and their whereabouts were unknown. St. Marks NWR is known to historically support breeding Wilson’s Plover. However, the last systematic survey occurred a decade ago in 2008. These surveys provide us with a snapshot on distribution and productivity at the refuge, but more importantly the surveys provide critical information that fills in the current data gaps for Wilson’s Plover in Florida. Help us put Wilson’s Plover back on the map by exploring historic nesting sites, visiting areas with documented Wilson’s Plover through ebird or habitat that map appear suitable for the species. Check out WIPL.nesting.sites.html for an interactive HTML map showing historic and current Wilson’s Plover nesting locations in Florida. 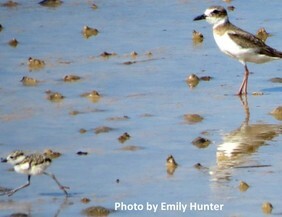 The interactive map can be used to help identify Wilson’s Plover nesting in your region or to target historical nesting areas like St. Marks NWR where survey coverage is needed. If you do explore Wilson’s Plover habitat, be sure to obtain permission from the landowner before you survey. If you are unsure about who to contact for permission, please contact your Regional Shorebird Biologist or email Shorebird@myfwc.com for guidance. We are inviting you to weekly monitor historic and active rooftops throughout the State of Florida from April 25th to June 20th. By frequently sampling during the peak nesting period we are trying to maximize the predictive capability of the flush counts. Monitor as your schedule permits. Please, keep covering the six time windows outlined in the Breeding Bird Protocol, but survey more often (weekly) if birds are present. If you have a new rooftop location, please contact the Regional Shorebird Biologist in your area and let us know whether you will be able to assist with regular monitoring of the site. As a part of Audubon’s stewardship program, we work with professionals that encounter shorebirds and seabirds as a part of their day to day job. 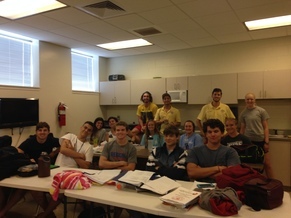 One of the key beach professional groups we've trained is the Pensacola Beach Lifeguards. Pensacola Beach Lifeguards patrol approximately 8 miles of beaches. This is the same 8 miles where Least Terns and Black Skimmers set up 3-6 nesting colonies each year. Audubon FL partnered with Escambia County’s Water Safety crew including Dave Greenwood, Alex Johnson and Jake Wilson to develop and present a short colonial seabird nesting workshop. The water safety crew allowed Audubon to present the seabird nesting workshop during each one of their 2018 lifeguard training sessions starting in February and running through May. This means every one of their approximately 80 guards now knows how to identify Least Terns and Black Skimmer, understand some basic biology and behavior of these birds, and knows best driving practices around nest colonies. Best of all, we now have a group of professionals that previously did not notice those birds on the beach, but now look out for these same birds. Thank you to the Pensacola Beach Lifeguards for completing the 2018 training session! If you are a beach professional and would like to receive shorebird training, please email Caroline Stahala. Email shorebird@MyFWC.com for more information about your local partnership, and to share important shorebird stories and photos. The Florida Shorebird Alliance (FSA) is a partnership of agencies, non-government organizations, and individuals committed to shorebird and seabird conservation in Florida. FSA partners coordinate their independent work and collaborate to address research, management, education, outreach, and public policy needs.